Californians have extensive protections from exposure to secondhand tobacco smoke where they work, eat, and play, but many are still exposed to secondhand smoke where they live. Landlords, property managers, and local governments can all help protect residents from drifting secondhand smoke by prohibiting smoking throughout multi-unit residences – and local governments can pass a variety of additional laws to help residents who suffer from exposure to secondhand smoke at home. 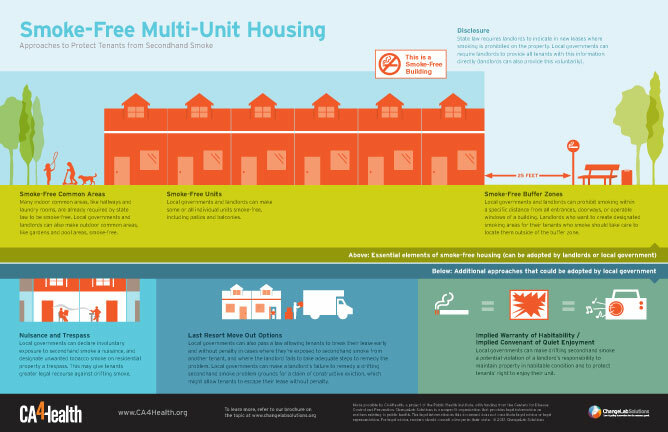 In collaboration with CA4Health, we created an illustrated roadmap of the 8 policy options that can protect tenants from secondhand smoke, plus a companion brochure that breaks down the policy options even further. For a more information, check out our smokefree housing guidebook and our complete collection of smokefree housing resources.